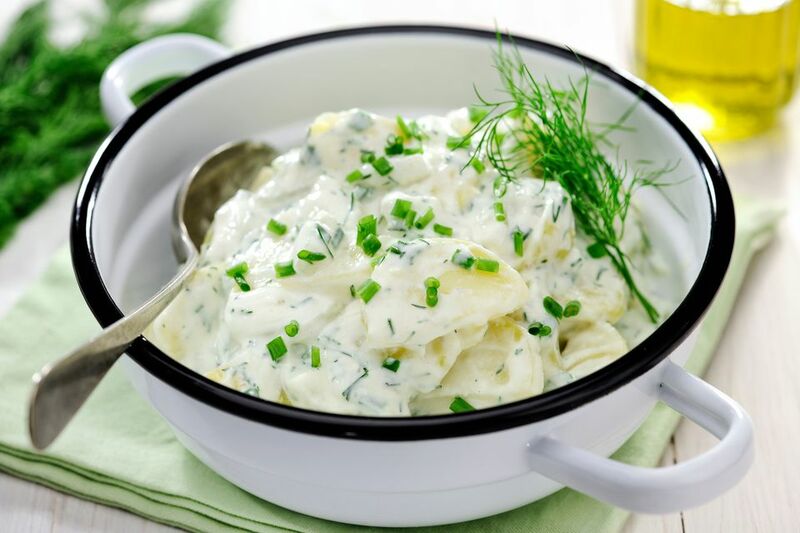 If you love dill, then this is the perfect potato salad for you. The tangy flavor of the pickle juice marries well with the creaminess of the mayonnaise. This dish can be served with just about anything from hamburgers to steaks, to grilled chicken or seafood. Place potatoes in a large pot and add water about an inch above the potatoes. Bring to a boil. Add a tablespoon of salt to the pot. Allow potatoes to boil in salted water for 20 to 25 minutes or until tender. Remove from heat, drain, and allow to cool. You can set potatoes in an ice bath for 10 minutes to cool them quickly. If using the ice bath method, drain potatoes once more and set aside. In a large bowl combine mayonnaise with pickle juice, chopped dill pickle, fresh dill, mustard, red onion, minced garlic, parsley, salt, onion powder, chili powder, and black pepper. Check mixture for flavor and adjust to your liking. Dice cooled potatoes into 3/4-inch cubes and add to bowl. You may also add chopped hard boiled eggs at this point if you wish. Carefully fold in potatoes with mayonnaise mixture until well coated. Transfer to a serving bowl, cover with plastic wrap and place in the refrigerator for 2 hours before serving. Salad will keep up to 3 days in the refrigerator. Do not freeze leftovers. Serve with your favorite grilled meats and vegetables. Did You Know You Can Make Caprese Salad With Watermelon?